I was telling my husband the other day that I never really pictured myself as the kind of mom that would peel the skin off of grapes to feed her child, but lo-and-behold - I have a child who loves grapes and I'm a mother that aims to please. ﻿ I received a holiday idea book in the mail from Nestle that included these awesome Butterfinger Eyeballs. Now, anyone who knows me knows that Butterfingers (and Oreos, but that's a different story) are my weakness. YUMMY! These will be a big hit at your next Halloween party! I found this copy of the recipe at Nestle's meals.com. This is also a perfect activity to discover the magic (and science) behind melting and freezing elements! "Create a memorable Halloween with this fun recipe for BUTTERFINGER® Eyeballs. With the delicious taste of creamy peanut butter dipped in melted, white morsels, as well as RAISINET® candy “pupils” and gooey red “bloodshot” markings, these tricky treats create an eye-popping experience for all to enjoy." BEAT peanut butter and butter in large mixer bowl until creamy. Beat in powdered sugar until mixture holds together and is moistened. Stir in chopped Butterfinger. Shape into 1-inch "eyeballs." Place on prepared baking sheets. Freeze for 1 hour. MELT morsels and shortening in large, uncovered, microwave-safe bowl on MEDIUM-HIGH (70%) power for 1 minute 30 seconds; STIR. Morsels may retain some of their original shape. If necessary, microwave at additional 10- to 15-second intervals, stirring just until melted. Remove one baking sheet of frozen "eyeballs" from freezer (keep other sheet in freezer until ready to use). DIP one "eyeball" into melted morsel mixture using a wooden pick or skewer. Shake off excess and return to baking sheet. Gently press 1 Raisinet on top of "eyeball" to make a "pupil." Repeat procedure with remaining "eyeballs" on baking sheet. Refrigerate until coating is set. Repeat with remaining sheet of "eyeballs" and coating. You may find it necessary to reheat morsel mixture before dipping second batch. Before serving, pipe decorator icing around eyeballs to create bloodshot markings. Store in covered container in refrigerator. Best served cold. Make sure you check out meals.com to find even more fun Halloween treats! And for an Extra treat on our Fall Family Challenge "E" day, here is your opportunity to Enter to win ﻿a Little Tikes Neighborhood Market (a $100 value) from Fun Saving Money. Click here to enter. 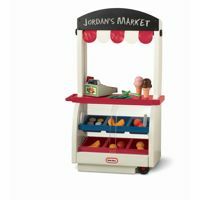 I love these imaginary play sets from Little Tikes!! I'm fairly certain that a certain little girl in my household will be getting her very first playhouse this Christmas. Thank goodness it's still a couple months away because it may take me that long to decide which one I like best! I love butterfingers and those looks...wait they don't look so good but they definitely sound good ; ) Yummy! I enter the neighborhood market giveaway too! It's so cute!